Numerous advertisers pulled out from Sean Hannity’s Fox News show this week after Hannity urged his viewers to treat claims Alabama Senate candidate Roy Moore sexually molested minors decades ago with entirely too much skepticism. 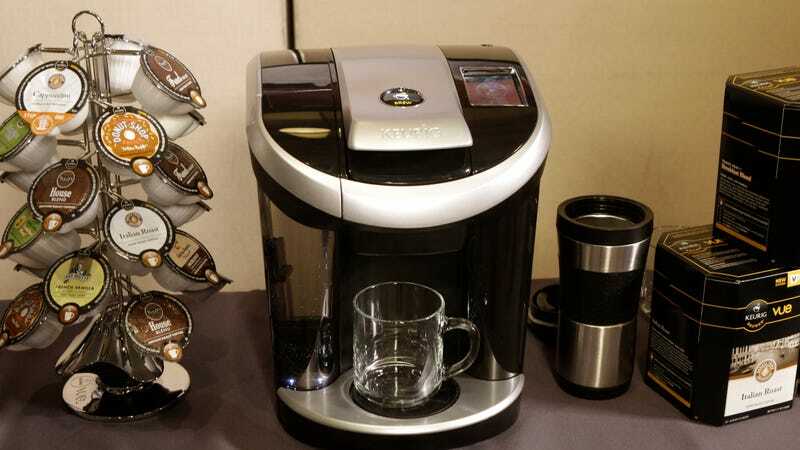 Among them were Realtor.com, 23andMe, and ELOQUII, but most notable was Keurig, which makes an eponymous brand of single-serving coffee pod machines. Keurig moved to pull its advertising after being flagged on Twitter by Angelo Carusone of progressive group Media Matters. In response, at least a few of Hannity’s fans have lost their freaking minds and declared their intention to #BoycottKeurig. This predictably escalated even further and now Twitter is filled with amazing videos of right-wingers smashing their costly home coffee machines. The intent is apparently to intimidate Keurig into once again sponsoring Hannity’s show, lest he fall victim to the same fate that awaited accused abuser Bill O’Reilly. Other people who shot the videos appear to be under the impression that destroying the Keurigs will make liberals angry, instead of belly-laughing at the view of conservatives destroying their own coffee machines in a fit of impotent rage. This video, in which a dude tosses one of the machines from a second-story balcony before shouting “Hope you’re happy, Keurig,” is a particularly good reminder that humans evolved from primates. Also, here’s a person who tried to jump on the bandwagon by throwing out some trash. Social media users getting real mad and posting videos of themselves destroying things they already own is just one of the many dumb political stunts that have increasingly become a staple of (mostly far-right) Twitter. All the way back in 2003, conservatives were pouring wine down the gutter in protest of France’s opposition to the Iraq war, but the rise of smartphones, streaming video, and social media thirst has given this dumb trend new life. After cereal company Kellogg’s pulled advertising from far-right site Breitbart last year, several Twitter users posted videos of them pouring perfectly good cereal down the toilet. When a number of NFL players knelt during the national anthem in protest of police brutality in defiance of President Donald Trump, a number of Steelers fans burnt, destroyed or gave away expensive team merchandise in a series of cringe-inducing posts. To recap, all of these are incredible self-owns because the point of a boycott is pressuring the boycotted party by refusing to give them money, and in all of these cases the boycotters had already paid for the products involved. So from Keurig’s perspective, there are two outcomes: They’ve lost the Keurig-destroyers as future customers but already got them to shell out hundreds of dollars for an overpriced, wasteful device, or the Keurig-destroyers will calm down and buy a replacement when people stop caring about the hashtag. Also, this entire controversy spawned after Hannity played defense for an alleged child molester. Yelling at a company in grainy Twitter video while fecklessly waving hammers and power tools is probably not the best way to convince them you’re not also a weirdo. Within a few days the Keurig-haters will resume insisting that they’re not actually mad and are in fact laughing, but video evidence of the madness that gripped this nation in 2017 will live on forever.